The observation of Monika with the beautiful colored contrail pictures made me remember to post the following photos. 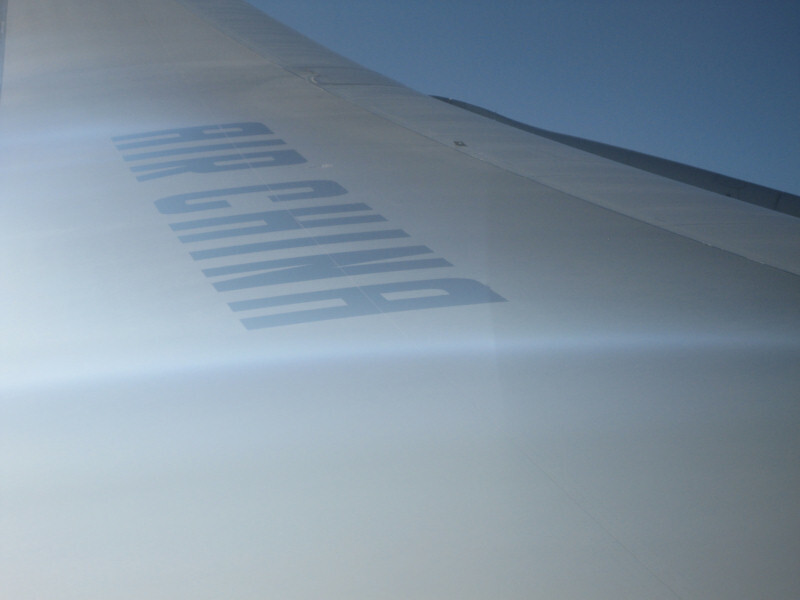 On a flight in a 747-400 from Beijing to San Francisco on August 18th I was seated right over the wing on port side of the aircraft. Initially I was disappointed with this window seat but I did get to see some interesting things. The first of these was a condensation cloud over the wing. The airplane was still ascending around 20,000 ft, when we flew through (super)saturated air. 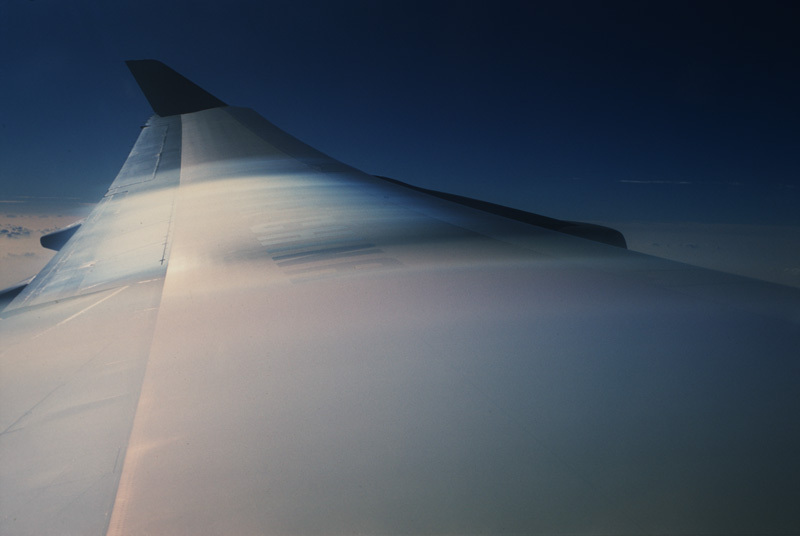 The faster airflow over the top surface of the wing and associated drop in pressure caused condensation. The cloud showed beautiful iridescent colors. The water droplets in the cloud were so small at this stage and all so uniform in size that they diffracted the light with constructive interference over large angles. 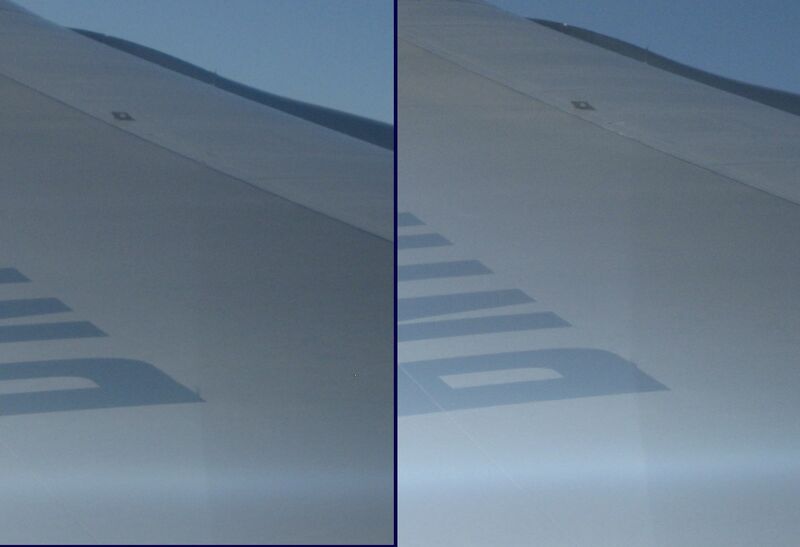 On the second photo this condensation cloud extends behind the wing. This is because it takes energy for a water droplet to form in supersaturated air, but once the droplet forms it quickly grows (or it quickly evaporates if the air is not supersaturated, as in the first photo). In other words, when the air is supersaturated, all that is needed is a trigger to initiate droplet formation, after which growth occurs because the air is supersaturated. This droplet growth is responsible for the colored trail between the exhaust contrails that can sometimes be seen, as in the photos posted earlier. But most often, the air is either not supersaturated, or already condensed into a cloud. Then, no long trail forms (only the engine contrails perhaps), or it is not visible (within cloud). Therefore it is not common to see this effect, especially from ground. At times a huge and bright corona formed around the sun. 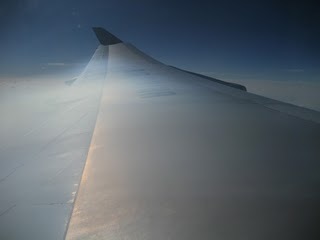 In this photo the airplane was banking right and the sun appeared low over the wing. 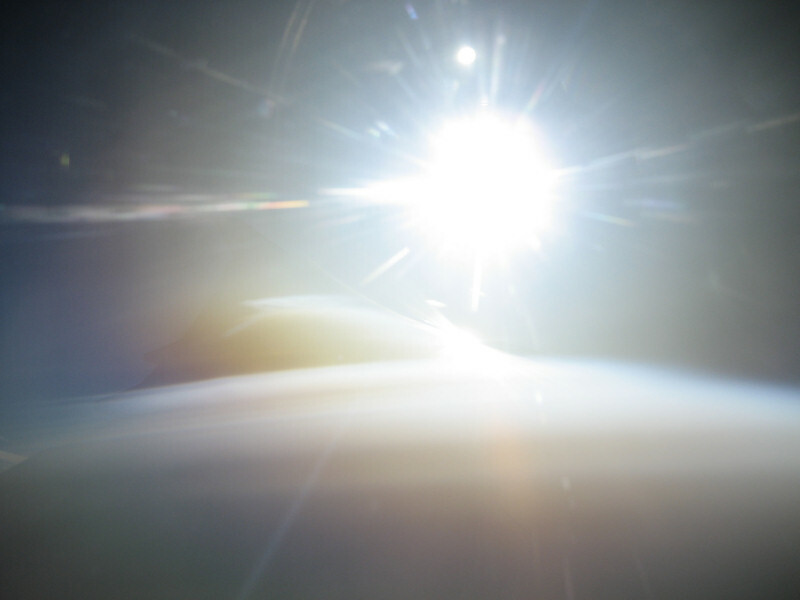 My apologies for the low quality photo – it is very hard to photograph through an airplane window with the sun in view. The other interesting thing, which I had observed before, but only now could photograph well, is the vertical standing shock wave that sometimes can be seen dancing above the wing of a commercial jet. Here, because of the condensation cloud, this shock wave actually became visible. Usually it can only be seen due to the feeble refraction and miraging of structures on the wing (you won””t notice this unless you look very carefully and at the right moment when the shock is positioned so that you are in its plane). The normal shock occurs because air flowing over the wing has to flow faster than below it, and this flow can briefly reach the speed of sound even if the jet airplane is flying slower than the speed of sound. Because the Mach number is about 1, the shock wave is almost perfectly vertically oriented, normal to the airflow. The shock plane in the photo can be seen as the vertical plane of enhanced condensation. I believe this is the rarefaction shock (as opposed to the compression shock) because condensation is enhanced behind the plane, indicating lower air pressure. Presumably the compression shock was somewhere ahead of this, invisible to me since I was not positioned in its plane. The sharp density gradient at the shock wave causes a lateral mirage, but any miraging can only be seen if you are looking near grazing incidence along the shock plane (which is usually not perfectly planar but a little curved). The last two photos better show the miraging along the shock plane. Note the effect on the pylon of engine nr. 1. Posted on May 15, 2011, in miscellaneous phenomena, observations and tagged contrail colours, iridescence, refraction, Shock wave. Bookmark the permalink. 4 Comments. Harald, your beautiful “field experience” gave the right explanation of the coloured contrails below, thanks for posting it! Yes, that is an excellent explanation for the coloured contrails of Ágnes. I never saw such kind of blog with such kind of matter…very interesting…original!